Flavored milk drinks are available in many varieties. Viscosities range from that of whole milk, to “thick milkshake” products which achieve their viscosity through use of thickening additives, sometimes in combination with freezing. 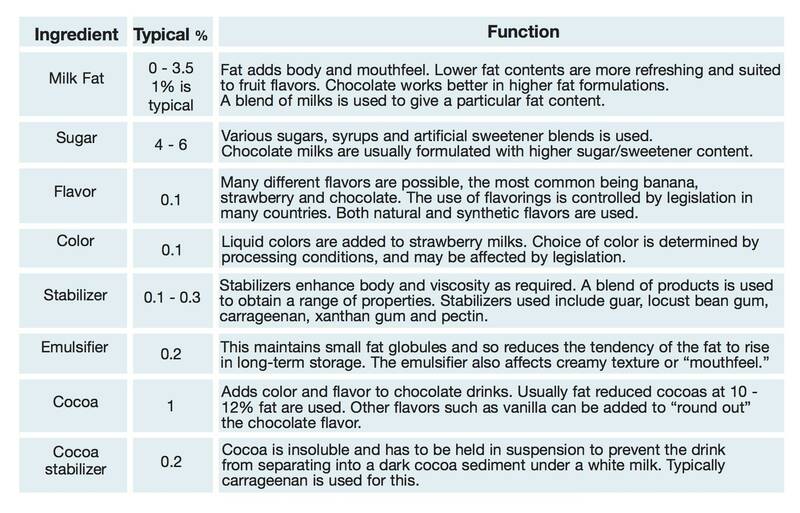 Yogurt drinks are similar in composition, but are processed differently and are not covered in this report. Milk ingredients are also used in smoothies to add texture and interest. Find out more about the Manufacture of Smoothies. Powdered ingredients - skim milk powder, sugars, etc. are added to the liquid and mixed until dispersed. Stabilizers and emulsifiers are added. These may be dry premixed with other ingredients, e.g. sugar, to reduce agglomeration and “weight” the powder to aid incorporation into the liquid. Flavor and coloring may be added at this stage. 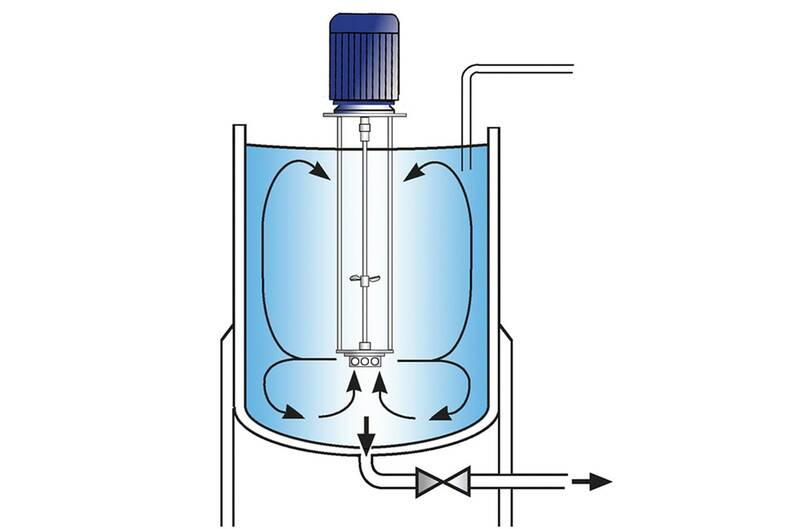 The mix is homogenized, usually by passing through a high pressure homogenizer. Some “thick milkshakes” are frozen at point of sale. Short shelf life products are pasteurized, typically in a continuous plate heat exchanger before cooling, bottling and then storage at 35 - 40°F (2 - 4°C). Long life products are sterilized at around 285°F (140°C), then packed under aseptic conditions, usually in Tetrapak® type cartons, or plastic bottles. Sterilized milk products are heated to around 275°F (135°C), then cooled to 140°F (60°C) before being filled into bottles. These are sterilized after being hermetically sealed. In most countries, legislation covers the composition and labelling of these products. These regulations restrict the use of certain ingredients and specify minimum content of fat and total solids. The powders are very cohesive and must be added at a controlled rate to reduce agglomeration of particles. Stabilizing and emulsifying agents have a strong tendency to agglomerate and require special handling. Potential full yield of stabilizers is difficult to obtain using traditional methods. 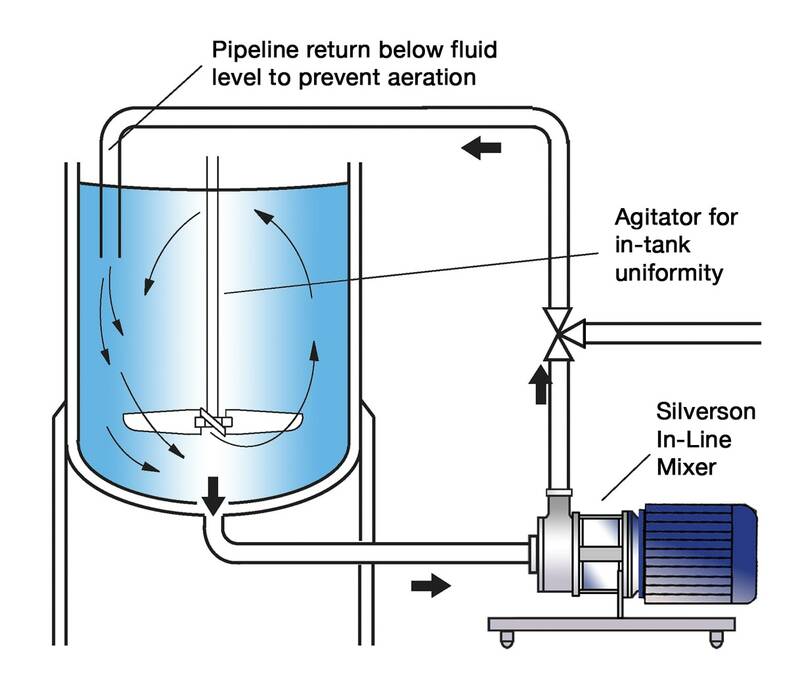 The high speed rotation of the rotor blades creates a powerful suction which draws the liquid and solid/powdered ingredients into the workhead. The materials are subjected to intense shear in the confined area of the workhead. Agglomerates are broken down in the gap between the rotor blades and stator wall. A lump-free mixture is rapidly obtained. The product is forced out of the stator as fresh material is drawn into the workhead. 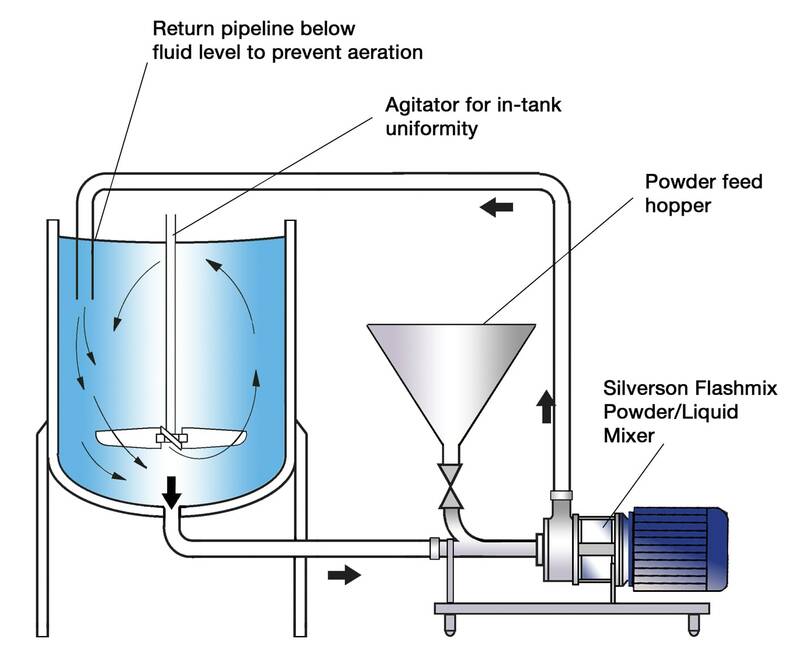 A circulatory mixing cycle develops in which all the material passes through the Silverson workhead. Maximized yield of raw materials as thickening agents are fully hydrated and other ingredients are properly dispersed.